Here's a challenge: open up any interior design or home décor magazine and find a space that is not somehow influenced by a global aesthetic. I'll bet you can't do it. You can try your most traditional continental or country home magazine and, more than likely, you will still find something from another country—and probably something from another country that's been influenced by yet another country. There's a very good reason for that. Whether it's European furniture and accessories with Chinese-inspired style or African patterns that have become a part of global social movements, when it comes to design, the cultures of the world are in constant conversation with one another, and have been for some time. Of course these days we have more than a few advantages over the designers of the past. With modern technology bringing unprecedented access to travel and information, the world that we live in is experiencing globalization at an unparalleled rate. As always, this ongoing discussion between cultures and countries is very clearly depicted through modern design. Ghanaian masks, Tibetan textiles, and Moroccan rugs are all among the many items that are finding their ways, not only into some of the most revered design and architecture magazines but into our homes as well. But when talking about global design, there's more at stake than just a beautiful home. For generations, the conversation on global design has been moved by larger forces such as the desire for trade, religious and philosophical exchanges and varying foreign policies—​all of which continue to move the dialogue today. This makes the trend towards more worldly décor not only appealing and accessible but also important on several levels as fair trade companies work to give back to the world through different economic, educational and environmental support programs. The next challenge for all of us is to take a small yet impactful step the next time we're shopping for global goods by being conscientious about what we buy as we're working to incorporate these phenomenal décor products into our homes. The hardest part of this step is always finding out what companies qualify as fair trade, and what causes their attention goes to. So to make that part a little easier, I'm featuring some of my favorite shops along with the initiatives that they support. These companies all offer fantastic pieces that will help you create a beautiful home while also helping to improve the lives of artisans around the globe. Education is often times the key to overcoming poverty. Although artisans from all over the world may have unique skills to create some of the most exquisite home accessories, many of them do not have the knowledge or means to turn their craft into a tool to support their family and improve their lifestyle. Indego Africa has made a commitment to combat poverty abroad by using both economic empowerment and education to strengthen their artisans. Described by their press releases as an, “innovative nonprofit social enterprise & Lifestyle brand,” Indego Africa pools, “100% of profits from sales, donations and grant support to fund job skills training programs for [their] artisan partners in business management.” By purchasing their products, you can assist them in their mission to help female artisans grow and run their own businesses. We are firm believers that a home should be filled with more than just pretty things. Our homes should boast unique items that reflect both our personalities, styles, and principles. In short, the design should have meaning. All Across Africa is a fair trade company that reminds us of a time when even the most common household pieces were full of meaning by featuring home décor products boasting traditional patterns that carry symbolic messages. Hope, unity, friendship, and welcomeness are just a few of the feelings that are shared in baskets woven by Rwandan and Ugandan weavers. 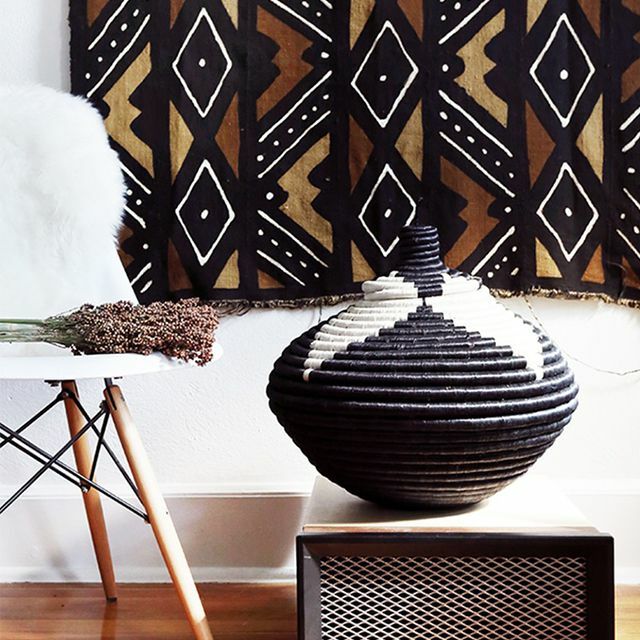 Incorporating accessories that emulate positive notions that are important to you is a great way to add some personality and a dash of color to your space while displaying the rich tradition of weaving from African artisans. Working with over 3,000 woman artisans in more than twenty countries, Global Goods Partners dedicates their efforts to help stabilize the income of their artisan's partners while also advocating for social justice. Artisans in Tanzania, Peru, and Guatemala, have benefited from fully equipped birth kits used to combat high infant mortality rates, emergency health care funds and organic gardens, water filters, smokeless stoves, and solar energy kits. Global Goods Partners proves that purchasing handmade home goods can make a massive difference in artisans’ lives, particularly of those living in marginalized areas around the world. “Design with intention,” is the message behind home décor company Local + Lejos. One of my favorite aspects of utilizing handmade products is celebrating the rich traditions of artisan crafts. The goal of Local + Lejos is to help families grow a business to achieve sustainable living while emphasizing preserving cultural traditions. You will be investing in making a cultural impact but purchasing from an array of home décor treats from Local + Lejos. Buying from companies that work to make life better for artists and their families around the world is a meaningful, modern home décor choice that you will never, ever regret.